Berto di Giovanni (Roberto di Giovanni di Marco), who was born in Perugia, was first documented in 1488. He held the post of treasurer of the painters' guild of Perugia on a number of occasions (in 1499, 1504, 1514 and 1522). Berto, who was associated with Perugino in 1494, subsequently became a member of the Workshop of 1496 (see below). He is documented from 1505 as an associate of Raphael, in connection with an altarpiece commissioned by the nuns of Santa Maria di Monteluce (see below), and it seems that he represented Raphael’s interests in Perugia from that time. 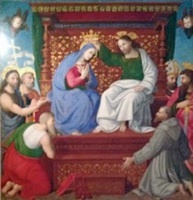 Apart from the works described below, Berto’s output in Umbria included a documented altarpiece (1506-7) depicting the Madonna and Child with SS Gregory, John the Baptist, John the Evangelist and Francis from the high altar of San Franceso, Montone is now in the Royal Collection, Hampton Court. The “Memoriale di Santa Maria di Monteluce” records that the nuns of Santa Maria di Monteluce decided to commission a new altarpiece for the high altar of their outer (public) church in 1503. They asked the friars at the Convento di Monteripido to recommend “il maestro il migliore” (the finest master) from whom they might commission it, and the friars recommended Raphael. The nuns therefore signed a contract in 1505 with Raphael for an altarpiece of the Coronation of the Virgin that would be delivered within two years. •the painting of the subsidiary panels in Perugia. •the death of the Virgin. Berto di Giovanni provided a carpenter in 1518 to make the frame of the altarpiece and a "cassa” (probably a cover that protected it when it was not in use). However, the altarpiece had yet to be started when Raphael died in 1520. The frame had been delivered to Berto di Giovanni for painting in 1524. He presumably began the three predella panels at that time. He also agreed to add a fourth predella panel, depicting the Presentation of the Virgin, as well of panels of SS Francis and Clare for the pilasters of the frame. This work was presumably completed in 1525, the date inscribed on predella panel of the birth of the Virgin. The completed altarpiece was probably in place on the high altar of Santa Maria di Monteluce in time for the Feast of the Assumption. ✴The main panel was confiscated by the French under the Treaty of Tolentino (1797). Antonio Canova recovered it in 1815, when it was secured for the Pinacoteca Vaticana. ✴The other panels were taken to Rome in 1812. Two of them (those depicting SS Francis and Clare) were subsequently lost. The four predella panels were returned to the church in 1817 and moved to the Galleria Nazionale in 1863. This recently discovered predella panel, which depicts the Pietà with St Mary Magdalene and a female martyr in tondi, is attributed to Berto di Giovanni. It is now in the Galleria Nazionale (Room 27). The predella seems to have belonged to the altarpiece (1513) that was commissioned from Eusebio da San Giorgio for San Francesco al Prato according to the will of Carlo Berardelli. The main panel of this altarpiece, of SS Antony Abbot, Francis and Bernardino of Siena, is now in the deposit of the gallery. This altarpiece, which is dated by inscription, is attributed to Berto di Giovanni. It was first recorded in 1801, when the nuns of Sant’ Agnese gave its main panel to those of Santa Maria di Monteluce in return for the hospitality given to them after their suppression in 1798. This main panel, which depicts the Coronation of the Virgin with SS Peter, John the Baptist and Jerome on the left and SS Francis, Paul and Herculanus on the right, is based on a drawing by Raphael that is now in the Ashmolean Museum, Oxford. After its transfer to Santa Maria di Monteluce, it was installed on the high altar, where it replaced the panel on the same subject that had been confiscated in 1797. It was listed among works to be sent to the Musei Capitolini, Rome in 1812, but it was subsequently decided that it should remain in the church. It was moved to the Galleria Nazionale in 1863. This altarpiece, which is attributed to Berto di Giovanni, was first recorded in 1683 on an altar on the left wall of Santa Giuliana. Agostino Tofanelli, the Director of the Musei Capitolini took the main panel to Rome in 1811. It remained there until ca. 1822, when it was reunited with the other panels in the church. They entered the Galleria Nazionale in 1863. ✴scenes from the life of St John the Evangelist (in the predella). This altarpiece was recorded in the 18th century in the sacristy of the Convento di Monteripido, and passed to the Galleria Nazionale in 1863. It depicts the Madonna and Child enthroned in a landscape, flanked by the kneeling SS James and Francis. Two flying angels hold a crown above the head of the Madonna. This panel seems to have been the object of a dispute between Friar Pietro da Castello and Perugino that was settled in 1518. It seems that, although Perugino had received the commission, the panel was actually painted by another artist. Laura Teza (referenced below), who published the relevant document, attributes it to Berto di Giovanni. In 1502, Berto di Giovanni, Eusebio da San Giorgio and Nicolò da Cesena received payment for frescoes for the presbytery of the Duomo (later destroyed). Berto di Giovanni painted a series of frescoes in Palazzo Alfani (now Palazzo Conestabili). A fragment depicting the Virgin and two saints in a landscape passed into the ownership of the Regione Umbria and is now in Palazzo Donini. This banner, which now forms the altarpiece on the altar of the Cappella del Gonfalone of the Duomo, is the last recorded work of Berto di Giovanni. It was painted during an outbreak of plague, and was one of the last votive banners of this sort to be painted in Perugia before the Council of Trent. It depicts the Virgin physically staying the hand the vengeful Christ who prepares to unleash punishment to the frenzy of people below. SS Herculanus and Joseph, to the sides of Christ and the Virgin, also plead for Perugia, which is represented by an interesting cityscape. This banner, which is variously attributed to Berto di Giovanni or Dono Doni, was incorporated as the altarpiece of the Altare di San Giuseppe in San Rufino in 1670. It depicts St Joseph showing the Virgin’s wedding ring to an audience of kneeling men and women, with a cityscape of Assisi behind. The predella (mid 16th century), which depicts the Holy Family with SS Antony of Padua (on the left) and Bernardino of Siena (on the right), is more securely attributed to Dono Doni. This panel, which is to the right of the entrance to the sacristy of Santa Maria degli Angeli, is attributed to Berto di Giovanni.